The World in My Kitchen: A Giveaway to CSN Stores! As promised, even if it is a little late, I am hosting my very first giveaway on this blog! CSN Stores offered me $30, either to use for myself to review an item or to give away to my readers--I chose the latter! Just enter below in the comments for a chance to win a $30 gift certificate at any one of their 200 stores. 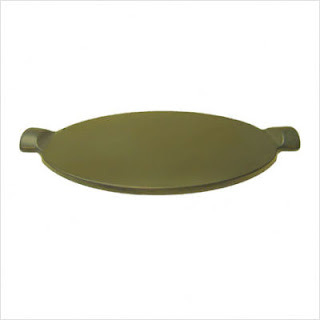 ** My personal favorites are the Modern Furniture store, All Modern, and, of course, Cookware.com. If I had to choose, I would order the Emile Henry Flame Top Pizza Stone (above)--I'm in the market for a new pizza stone, and this one is just so beautiful (and almost half price on this site)! Just "Like" Mindy's Mouthful on Facebook and come back here to let me know. (If you are already a fan, just say so in the comments below.) You MUST leave a way for me to get in touch with you if you win. 4) Tell me what you'd order from CSN Stores. That's a total of 5 possible entries! (Make sure to create a separate comment for each one below.) I will choose a winner with a random number generator. The giveaway will close on Tuesday, March 8th at 10:00pm EST. **This gift certificate will not cover international fees. Annnnd I posted on Facebook ABOUT the contest. Finally, I didn't have a lot of time to look around, but there's a chance I would be boring and just get a shredder with the card, since we've been needing one, unless I dug around and found something very special. I would get Timberland Sandals for my daughter. I don't do FB, but I do like you. I follow on gfc reader. Does that work? I just linked to the post on Facebook as well. As far as something I would order from CSN, practically anything for the kitchen would suffice, but I am in need of a good cutting board, my personal favorite being the Catskill Craftsmen that I am saving up to purchase. I have you bookmarked in my favorites, and I'm a fan on Facebook! If I won, you of all people know how badly I'm in need of new cookware, so I think I would have to go in that direction. I like you on Facebook. I don't do Twitter yet. CSN is a terrific place to shop and great giveaway Mindy. I would buy some rattan wicker plate chargers for our new condo. Hey, Mindy! I already "like" you on Facebook, I just posted your contest as my status, and if I won the certificate, I'd use it towards this: http://www.cookware.com/Frieling-0090-FLG1005.html because I just got a food dehydrator (for Valentine's Day, by request), and I want to be able to de-seed my berries for fruit leathers! I liked you on facebook (Rust Hawk). Thanks! I shared this giveaway on my facebook wall (Rust Hawk). I am in desperate need of a new immersion blender and I have my heart set on a Cuisinart. It would definitely be going towards that. Oop, I need to write different comments for each thing I did . . . I posted you as my status . . .
word verification: rellsh - I rellsh the chance to comment on your spiffy blog! Next entry: if I won the certificate, I'd use it towards this nice food mill: http://www.cookware.com/Frieling-0090-FLG1005.html because I just got a food dehydrator (for Valentine's Day, by request), and I want to be able to de-seed my berries for fruit leathers! Thank you for the comment on my blog. I would love to join you all! Sorry it took so long to respond I had to take a little breather from food. Ugh! But I am back now. Just let me know what I need to do. I love your blog! It is nice to meet a fellow KY blogger! I just posted your link on Facebook too! I follow you on FB "Crave to Save"
Thanks for the giveaway! I like you on Facebook! I follow you on Twitter and I tweeted!! Uniform Online is first online uniform platform which is an inspiration from the dynamic and fashion-forward team. They are provides best and most demanded Uniform clothing stores Singapore, intelligent and fabric clothes , where you get all types of professional, non-professional, school uniform and different types of clothes. FiableCleantech products not only help to clean the house with ease but also you can also handle it comfortably without any difficulty. It is a genuine proclamation that the wellbeing specialists will look more expert while wearing a Medical Uniform, as without it one may have a qualm with confiding in a medical expert. The ESTNOC stands for Estonian Network Operation Centre has provided the Web Hosting Service in Estonia which ensures the safety of all important data which is saved online. Uniformonline offers the Uniform clothing store Singapore online platform to help the people to get the latest design of uniforms with us. Fiablecleantech have also added the Pressure washing which remove all the dirt and brighten your house with ease. Our modern distribution networks to facilitate prompt deliveries of even the urgent bulk orders and emerged the top service provider it offers the product of affordable price as comparing to its competitors and have a wide distribution network. We at Estnoc have built our Data Centre Services on highly secured and redundant network in more than 30 locations around the globe. Looking for cruising and party or events around coastline, Rent Any Boat or Yacht in Dubai for fun and fabulous holiday. Tabcii works on the Performa of price to performance ratio where our customers get the best conveyance according to their needs at the cheapest rate possible. Uniform Online provides Formals Blazer Singapore which is well fitted and well-designed blazer as per your demand. Alaquanic offer absolute project management capability for processed installation through a single sourced responsibility that stakes over the total project activity i.e. from initial consultation and radical designing. Tabcii offers seamless online bus booking experience where travelers can enjoy this eminent conveyance for all the national routes at the cheapest rate possible. We offer both standard and luxury buses like Volvo AC, Non-AC, Deluxe and many more private buses. Tabcii have created a travelling community where everyone can travel or transport his/her logistics at a much instant manner without facing any constraint. In our spectrum we have vehicular options like taxis, cabs, buses, auto rickshaws, ambulance and trucks. On uniform online, you can visualize your colour, etch your brand, touch your material and own your uniform at the affordable prices. Uniformsonline designs and manufactures the contemporary Retail uniforms in Singapore that symbolizes a strong image of our brand that can change the perception of the customer when he/she encompasses. Uniformonline offers the Uniform clothing store Singapore online platform to help the people to get the latest design of uniforms with us. We have wide range of collection of uniforms of Bank uniform and prestigious and scrub uniform. Tabcii is an online truck booking platform which enables a disruptive pricing mechanism and reliable truck loading services to our customers. We also offer an extensive range of Spa uniforms in Singapore which provide a sleek and stylish look. These uniforms are soft and comfortable to wear, and yet also looks trendy and attractive. Uniformonline offers medical coveralls made of highest quality which will hold up to the harshest of jobs. Our expert team constantly working, so that our customer can complete all the process online without any problem. Uniformonline offers business model is giving to our customers to best valued uniforms possible and manufactured of highest quality.It may be formal look for any event in office or any party or wedding or any interview or business meeting in the office it definitely enhances your look. As a Retail uniform in Singapore wear provider, we offer both instant and customized corporate wear for your particular marking needs. Our uniform bundles can be completely modified to consent to each requirement for rationalization, from textures and fit to plan and points of interest.